A big thanks to “Flip” author Martyn Bedford for stopping by Cracking the Cover during his blog tour. Have you always wanted to write? Why? Right from when I was at my first school, English was my favorite subject — the only one I was really good at — and writing was all I wanted to do. As an only child, I spent a lot of time playing by myself and I would invent (and write down) elaborate “story” games involving my toys. The world of the imagination seemed much more interesting and fun than the real one … and still does! By the time I was in my teens I realized that being a fiction-writer wouldn’t be an easy way to make a living so I went into journalism. It was a way of using words in my job while I carried on making up stories in my spare time. Now I’m lucky enough that storytelling IS my job. 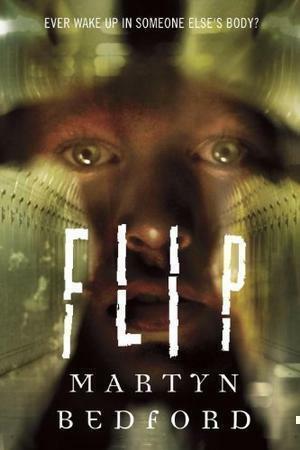 “Flip” is your first book for young adults. Why did you decide to write for this age group? Was it hard to relate to teens? After writing five novels for adults I had an idea for a story which seemed much more suited to a younger audience. My editor at the time advised me against switching to a different readership and, in part, my decision to go ahead was a reaction against being told what to write (or not to write). Also, after so many books and so many years writing for adults I fancied a change. Relating to teens wasn’t really an issue for me in that I didn’t try to. The reader I was writing for was the teenager I used to be, so I guess you could say I was trying to tap into my younger self. I know life for teens these days is very different in many ways to what I experienced but I think a lot of the basic physical and emotional processes of adolescence are pretty much the same as always. Do you have any rituals? Do you write all day? At home? No rituals. After 13 years as a newspaper journalist I’ve become conditioned to just sitting down at my desk and writing. And, yes, I write at home in the corner of a large loft-conversion bedroom at the top of a four-storey Victorian row house. I start around 9am, once both my daughters have left for school, and write till around 5 or 6 p.m. with a couple of hours’ break for lunch and a walk. Sometimes I’ll spend the morning writing a thousand words and the afternoon reducing them to 200. Where did the idea for “Flip” come from? Believe it or not, from a trip to the dentist when I was about 10 years old. I discovered that there was another “Martyn Bedford” registered at the same surgery — same spelling, different address — and I was fascinated by the idea of another “me” living somewhere nearby. I imagined us swapping lives and what that would be like. The idea has stuck in my head all this time before I finally got round to turning it into a novel. “Flip” is about soul swapping. Do you believe it’s possible? What would you do if it happened to you? No, I don’t believe in soul swapping. I don’t even believe in the soul. I believe we have a unique, individual consciousness but that it is located in the chemical and electrical processes in our brains (and so can go nowhere). And when we die our consciousness dies with us. If soul swapping was possible, and it happened to me, I’d probably spend 24 hours freaking out, then try to calm down enough to decide whether I liked the new me better than the old one. If I did, I’d stay put. But only if my wife and daughters could come, too. What were the challenges working on “Flip”? And conversely, the highlights? The biggest challenge was to capture the tone and mindset of a 14-year-old boy so many years after I was that age. The highlight was writing the scenes between Alex and Flip’s sister, Teri — I never had a sister, but I would have enjoyed all the sarcastic banter and verbal swordfights with a sister like her. Looking back, how has your writing evolved from your first novel until now? Oh, that’s a tough question. To be honest, I don’t really analyze my writing or its evolution from one book to the next — I leave that to readers and critics to figure out. I think it would damage me as a writer if I started to theorize my own work. Why do you think your writing appeals to young readers? Well, I don’t know that it does, yet — “Flip” has only been out a couple of weeks! If it does, then I hope it’s because teenage readers identify or empathize with Alex and become engrossed in the story of what happens to him. I hope, too, that my take on what it’s like to be a young adult strikes a chord with readers in that age group. If it doesn’t, then the book deserves to fail. Did you have a favorite book or book that really resonated with you as a young reader? The first novel I remember loving as a young child was L. Frank Baum’s “The Wizard of Oz.” As a teenager, the two books that stood out for me were “Great Expectations,” by Charles Dickens, and J.D. Salinger’s “The Catcher in the Rye.” I really, really wanted to be like Holden Caulfield. But, before that, I wanted to be George, the tomboy girl in Enid Blyton’s “Famous Five” series. A psychoanalyst would have a field day!